Today we are due to make our return trip over Confederation Bridge. On windy days it is closed to high sided vehicles. At 12 feet (or not, see earlier posts) we are classed as high-sided. It is windy. Will we escape? It turns out yes we will, although the cross-winds added an extra dimension to the terror factor. It has been windy since we arrived but today, although still sunny, there is what we would call a howling gale. Next thing we know we will be in Kansas on top of a wicked witch. Oh no, I forgot, we don’t have visas. We are heading west on road 15. We have opted for a slight detour via Fundy National Park, on our way to St. John’s. This is worth the effort. The Petitcodiac River is nicknamed ‘The Chocolate River’ and the red soil really does make the water look like molten chocolate. No photographic evidence I am afraid – the old ‘nowhere to stop’ syndrome striking again. We come to Alma, which has, apparently, the highest tides in the world, so another superlative ticked off. As we enter the National Park there is a booth where permits are to be purchased. It seems we do not need one of these and better still there is a car park. Chris goes to look at fishing boats and I photograph the no longer particularly chocolate river. There are also some interesting wooden lobster pots – here called traps. We narrowly avoid another low bridge related incident but as we enter St. John’s, the sat-nav is confused by a new road. A surreal series of left and right turns ensues and I wonder if we will ever get off this magic roundabout. Eventually we arrive at Rockwood Park site. This is part of what, in the UK, would be called a country park. Some children are rock climbing. This appears to be an organised activity and they have crampons and safety harnesses but no helmets! I know I am risk adverse but can you imagine this being allowed in England? 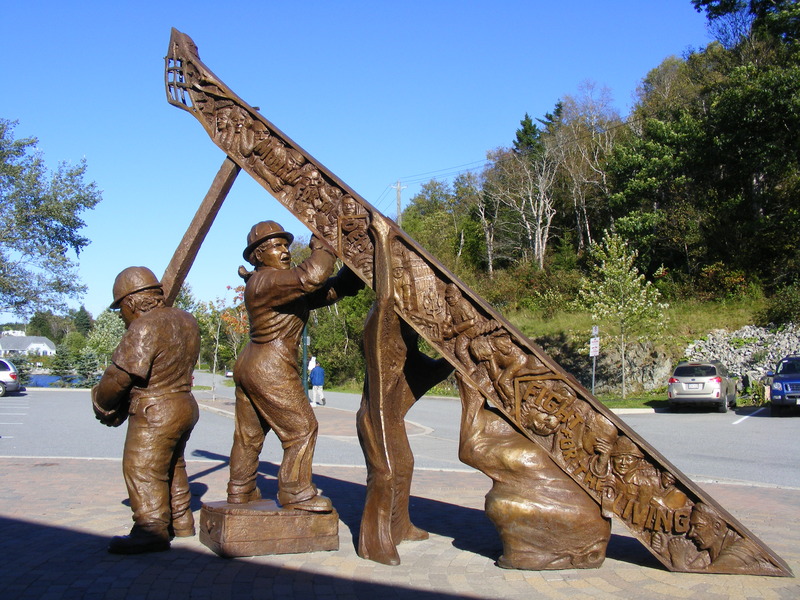 We see our first moose, albeit a wooden one and a sundial sculpture in memory of all workers who have been mentally or physically injured whilst at work. This has been set to be accurate at noon on 28th April when these workers are especially remembered. We have allegedly been put on a ‘quiet’ pitch. This may be a relative term as there is prolonged loud hooting from what we think is a nearby train. The consolation is that I appear to be able to get internet access from the van, rather than skulking in the laundry, as is supposedly necessary. Another 250 miles to go tomorrow, back into Québec. Ideally we would like to make an early start but I am not relishing the thought of the magic roundabout in rush hour. Another day on Prince Edward Island, which has a similar population to the Isle of Wight yet is four times the size. We manage to persuade a bank to change our US dollars, which we didn’t need for our Baltic cruise, for Canadian money. Even finding a bank was a real achievement – this was the first we’ve seen with stopping potential. We now might keep the van in petrol for the next week. We head in to look at the other side of Charlottetown, walking along the boardwalk by the bay. We haven’t done very well for seeing birds on this trip but we do spot some Blue Jays (identified later courtesy of Google), unfortunately though not in a photographable location. 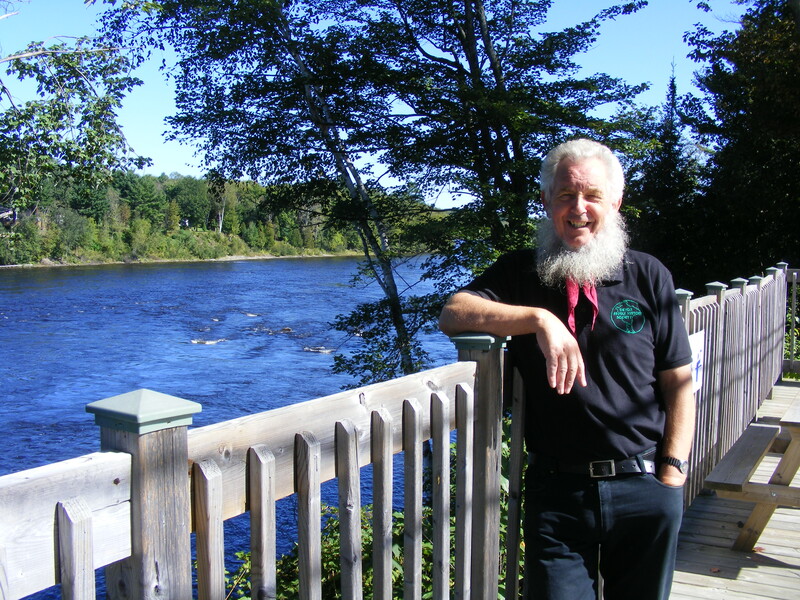 In the afternoon I give my emigrants talk to the lovely folk of PEI Genealogical Society. It was great to meet several people with Devon ancestry and also someone with Isle of Wight connections. The venue was the coach-house of Beaconsfield Historic House, which was built for James and Edith Peake in 1877. It is a beautiful building but the acoustics didn’t quite live up to the splendour. Over the last few days it has materialised that there are things in my house that are needed in my absence. So, although I have not reached the level of being indispensable, my possessions, or at least possessions if which I am the current custodian, have. Our culinary efforts in the van have been somewhat hampered by the random kitchen equipment that is and isn’t supplied. We have a full sized fridge-freezer but absolutely nothing in which one can cook anything inside the oven. We doubt the wisdom of utilising a saucepan for this, as it probably wouldn’t be the best thing for the plastic handles. This campsite however has decent facilities and a manned reception, with a shop that sells large, heavy duty foil dishes – hurrah. These are probably designed for barbequing but can be (we hope) dual purpose – watch this space for how we fare. All the pitches we have stopped on have come equipped with places to light an open fire – a strict non-starter on UK sites. Our neighbours over past days have been using these to cook food or just to sit beside in the evening. Several have had very small, unsupervised children near these open fires. I know children can and should be taught to respect fire but we are talking toddlers here, with no adults in sight – I daren’t look. As we are on PEI for more than five minutes – three whole nights thanks to our previous intended site being closed (this will be our longest stay in one place) – we have found out some things about it. It is known as ‘Spud Island’ because of the potatoes that grow in its bright red soil. It is also a centre for lobster fishing. The other main claim to fame seems to be as the home of L M Montgomery, author of Anne of Green Gables. Today we find our first car park and are able to abandon van and explore Charlottestown. We look round the Founders’ Museum. This celebrates the confederation of eastern Canadian states in 1867. The story is told by a very patronising virtual woman and we learn that the initial meeting, held in 1864 in Charlottestown, was to debate a union between the maritime colonies of PEI, Nova Scotia and New Brunswick. Somehow, what was then Canada West and Canada East (today’s Ontario and Québec) got in on the act and the discussions moved to Québec, with Newfoundland getting involved. In the end, PEI and Newfoundland backed out; in fact Newfoundland didn’t become part of the Dominion of Canada until 1949. 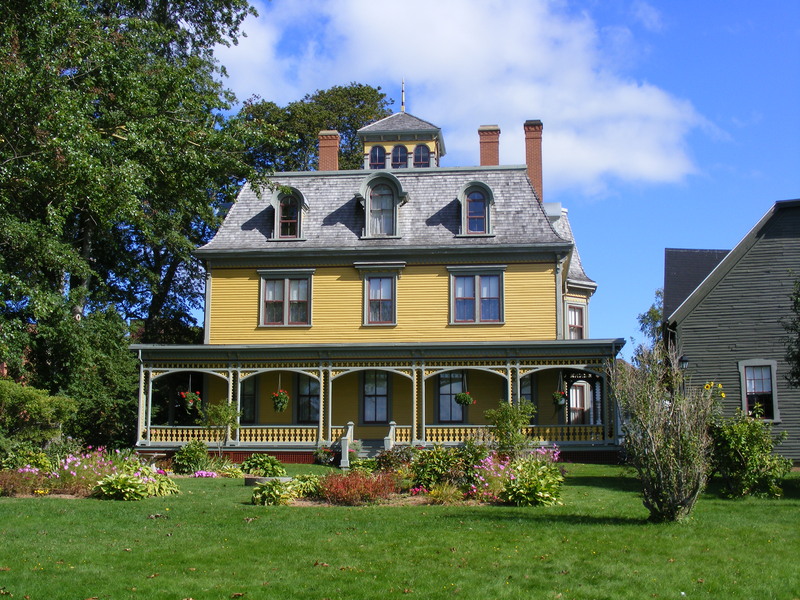 PEI had hoped that confederation would lead to the very high percentage of absentee landlords being bought out but the Québec conference did not want to take this on board. PEI waited until 1873 to join the union, when they were desperate to be bailed out having spent heavily on a railway. The story has shades of our recent Scottish independence referendum in reverse. I really would like to buy a book about the history of PEI but all the museum can offer is Ann of Green Gables and the like. The chances of us finding a bookshop are seriously less than zero. We did well to find a souvenir shop for postcards, which in the absence of a Post Office, lack stamps and will probably be posted in England. And then of course, could I resist going in to the Archives? This was ostensibly in case I could buy a book, which they didn’t have but we were sucked in. We must have looked like rank amateurs as it was totally unplanned so we had two blunt pencils between us, no reading glasses for Chris, no ID for me (but I was let in on the grounds of my ’honest face’), no notes and no list of what to look for. Dredging up the key names from my brain, we did some research using their card index and I did find out a few things, necessitating a quick revising of my forthcoming talks. There are difficulties caused by the lack of civil registration until 1906 and the fact that burials weren’t routinely recorded. I clearly need to spend about a fortnight here, so who would like to fund that? Ideally I would need to stay within walking distance of the archives please as I am still not comfortable with the driving (or should I say passengering). Who can get their head round a country where you can go when a traffic light is red (sometimes) but going when it is green is clearly neither safe nor appropriate on all occasions (found that out the hard way)? Then back to the site to run through my talk for tomorrow and to resume our war on the fly population. We thought we had conquered them but it seems some may have bred before their untimely demise and we are now tackling their numerous offspring. We make another very early start as today is the longest leg of our tour. So before 7am we are heading east on the 132 again and rounding the Gaspé Peninsula. More quieter roads and spectacular scenery, in some ways similar to the south-west peninsula, if you ignore the pine trees. The drawback of heading east at this time of day is that you can’t see anything because the sun is in your eyes; fortunately there are not many fellow travellers. Yesterday and today we have had hills, this makes a change from the pretty flat terrain of earlier in the week. I give our noble driver ten out of ten for ignoring the sat-nav who wants us to turn left on an unmade road. At some point the 132 est, that has been our friend for the best part of three days, becomes the 132 oest, as we drive along the north bank of the River Patapedia (I kid you not). We encounter yet more Travaux (roadworks to you English speakers). There are a number of gentlemen at a fairly significant road junction waving flags in a manner that would put any self respecting majorettes to shame. This is obviously to indicate which traffic should be moving but the significance of the random waving is lost on us. Some of the roadworks seem to involve injecting tar into cracks and then unrolling what looks like toilet paper over the top – each to their own. More fire hydrants, which in Newcastle are painted to look like Disney characters, also notable are all the overhead electric wires. We have noticed that motor cyclists rarely come alone and that they favour massive Harley Davidson bikes or trikes. We are now in our third Canadian province, New Brunswick and I can confirm that our van is not twelve feet high, as previously reported, nor indeed eleven feet eight inches high. This is just as well. There really was no warning of that low bridge. We are exhorted to beware of the cheverils but this is beyond Google translate – I am sure it doesn’t mean low bridge though. Tonight’s site, after over three hundred miles driving, is at Bathurst Marina. The site itself is not much more than a car park but the adjacent beach is attractive and we are able to download the many emails that have been piling up and restock the Kindle. Canadians consider this to be off season and our neighbours on the site obviously think we are a bit odd to be travelling at this time of year, despite the truly wonderful weather. We do not have so far to go today and have carelessly lost an hour by crossing into a new time zone, so a later start. We being with a quick walk round the very attractive Youghall Beach and then set off southwards across several rivers on the 8 and 11. These are slightly less awesome than our old friend the 132 but we knew that we couldn’t carry on with such beautiful scenery for ever. Here we have plenty of forest but even fewer opportunities to pull over than previously. Do Canadians never stop on their car journeys? We have sussed that the occasional church does sometimes have a parking area that we can pause in and we make use of this. 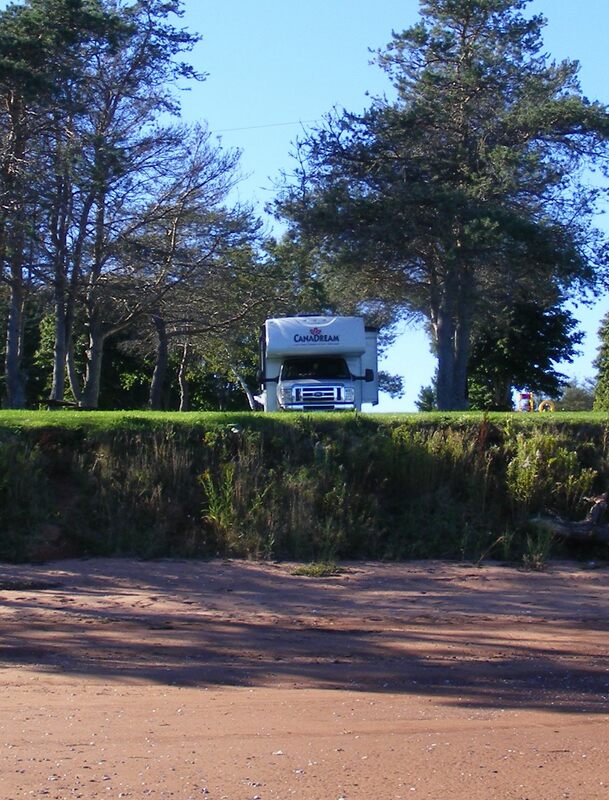 We are due to stop on a site close to the bridge to Prince Edward Island. We have emailed ahead and received a reply that informs us that we have no need to book. What they neglected to tell us was that we didn’t need to book because they were closed for the winter. The Canadian response to tourism is similar to that in England – everything shuts for the winter, although our ‘winter’ is shorter than theirs. The attitude is totally different in New Zealand and Australia where tourist attractions/information centres and so on are open 364 days a year (they do have Christmas Day off). The Canadians, like us, seem to play at tourism. I have to say that Scotland are getting their act together and in general are better than England at providing for visitors. We decide to press on for the additional fifty miles to tomorrow’s site on Prince Edward Island (province four) and hope that they are a) open and b) have room. We have paid a deposit for this site so they had better be. The sat-nav is telling us it is 284km away. We know it isn’t. It seems that the sat-nav is unaware of the Confederation Bridge and wants us to go by ferry via Pictou. I then worry that for some reason we won’t be allowed to go across the bridge. We find a one pump petrol station in the middle of nowhere, where petrol is nonetheless a reasonable price and check with the owner who appears to be a close relation of the Clampits. It seems we are fine to cross but there is a toll payable when we want to escape. Confederation Bridge is the longest in the world, at just short of 13km. It is also quite narrow, quite high and there is a fiendish crosswind. I shut my eyes for a lot of it. It has been there since 1997, so no idea when the sat-nav didn’t want us to use it. Once on PEI things are more familiar. There are flowers, shops that look like they are open and places to park! We find the site, which has plenty of facilities and are allocated our premium pitch within yards of the beach. We go for a stroll along the ‘sand’ which is more like red mud and therefore has little sandcastle potential. There are thousands of mussel shells and three small boats in the bay, who seem to be catching mussels and winkles. Chris chats to some of our fellow campers, whose trailers really are officially bigger than my house, ‘oh, this is just a small one’. No, really, it isn’t, you should see our caravan back home. 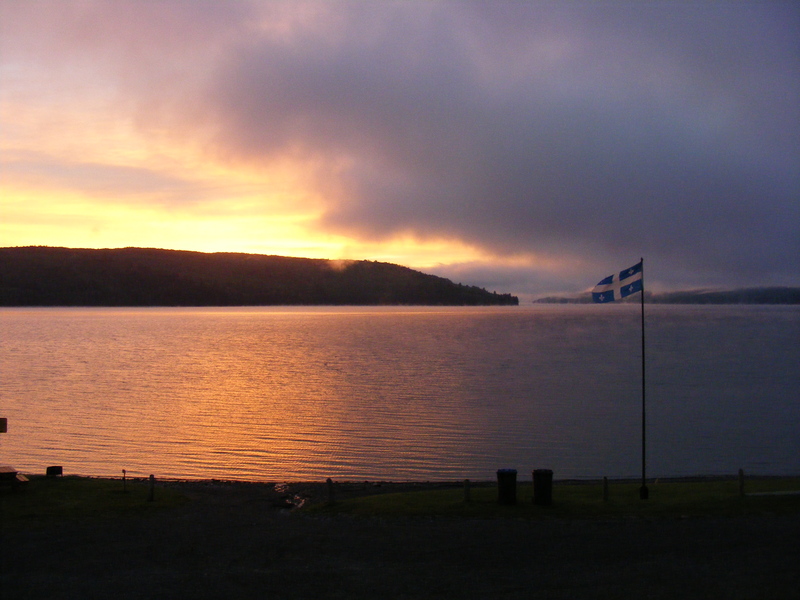 I wake early enough to see an impressive sunrise over Lac Témiscouata. By the time I have pulled on my clothes, I am just a few seconds too late for the idea photograph but it is still beautiful. There is no sign of life on the campsite. We think it is 7.30am. Our Canadian-set watch says it is 7.30am. Our bodies still think it is about midday but it might actually be 8.30am as we may have crossed into another time zone (turns out it was 7.30am). Either way, it is clearly too early for the site receptionist so we have no way of paying. We are due back at this site next week and plan to pay for both nights then. We have to be careful at the start of our journey as we are only twenty miles from the US border and although we have permission to take the van to the US, we lack the necessary visas for ourselves and whilst it would be nice to put our feet on US soil to say we had been, it is not worth the risk. We drive through acrid smoke coming from a factory that is subsuming the nearby houses; I decide that this is not high on my list of places where I want to live. There are patches of thick fog as we head north through the forest. 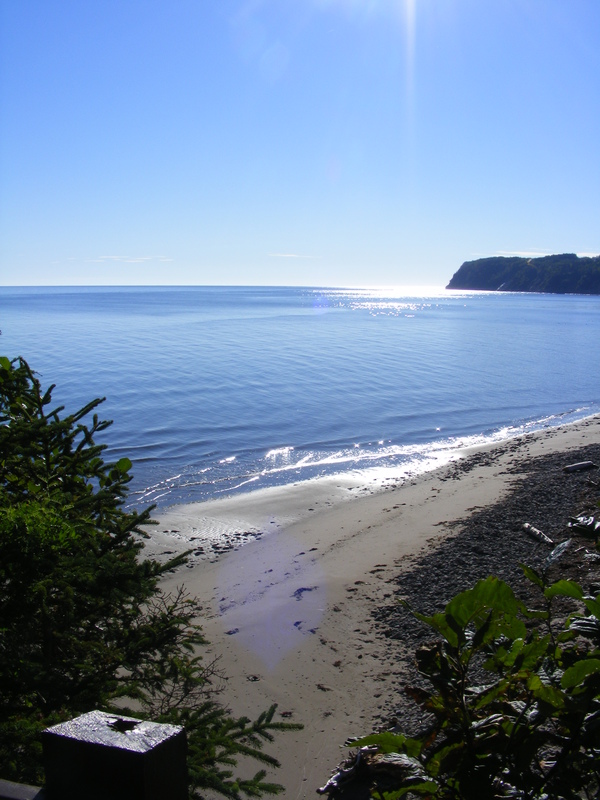 By dint of a road closure we have found our way on to the 232 and the 55 north, just where we want to be and then a second day of the 132 est along the northern shore of the Gaspé Peninsula, complete with more lovely vistas of the river. We draw in to a petrol station for more fuel, by the end of today we will have done more than 1000 miles. In the nick of time, I spot that the headroom under the canopy is eleven foot six. This may not bode well for our allegedly twelve foot high camper van. We decide not to test the accuracy of this measurement and go on to seek fuel elsewhere. I am fascinated by the yellow school buses, which look like something out of the 1950s. When one stops, traffic in both directions has to halt. Little stops signs open out from the sides of the bus to remind you. I manage to photograph a ‘beware of the moose’ sign, one of the typical barns with a double pitched roof and a church, albeit one with only one spire. Next on the list is a fire hydrant, also very old-fashioned looking. Today’s (un-photographed) wildlife haul includes a squashed racoon and a herd of captive bison in a field. Although today there have been a few more places where you are allowed to stop, it is virtually impossible to just pull over to take pictures or look at something of interest, or at least not legally. Not that Canadian drivers seem particularly law abiding. We have been told that double yellow lines in the middle of the road mean no overtaking. You could have fooled us. Judging by the number of people who have gone sailing past us when the lines are double we would never have known. As we near the site which, guess what, the sat-van does not recognise, we spot an information bureau. Great, we can ask for directions. Chris volunteers, despite us still being in the French-speaking part of Canada but unhelpfully it is closed. He does manage to find someone who understands not just English but Devonshire and we are sorted. This site too is totally deserted and a notice tells us that someone will be on duty at 10am, by which time we hope to be long gone. At this rate we could be in for a cheap holiday. In fact, Chris later tracks down the site owner who is very apologetic because the pitch chairs and tables have been put away for the winter. This is our cheapest site yet and our new favourite. Chris even rates the showers as passable. Up until now these have been of the wooden hut variety, nothing like we would expect in England – not that we are too bothered as the van has its own. We have a wonderful view over the St. Lawrence estuary, which is teeming with ducks. I wish I had thought to bring the binoculars, as they are just too far away to identify, even with the aid of my camera on zoom. We wage war on the flies that are a legacy from our site two days ago. My weapon of choice is a tea-towel 3:1 to us so far. 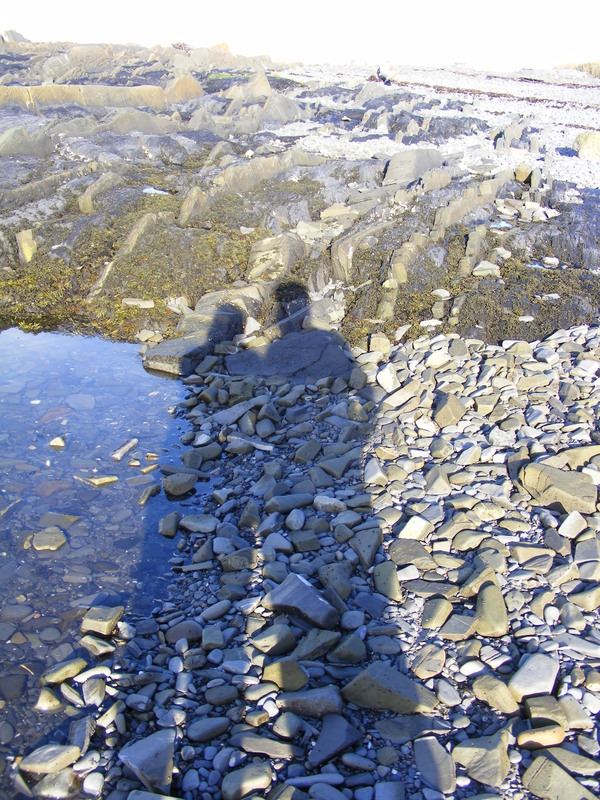 Then we walk the few yards down to the shore. Despite the noise of the ducks, this is incredibly tranquil and beautiful – just what we came to Canada for. Driftwood forms strange patterns and there are wild roses and rosehips by the shore. I dip my toe in the St. Lawrence, which is swarming with tiny baby lobsters. My only complaint is the lack of wi-fi and I am in danger of running out of things to read. I thought I had stocked my Kindle up with enough books to last six weeks. Here we are at the end of week one and I am already on the last book. I am convinced that Kindle books are shorter than ‘real’ ones. We awake to mist and heavy dew, signs that it is actually autumn, despite the mid-summer temperatures. I have established that we want to be on road 312, which runs along the southern side of the St. Laurence River. We find the 312 without difficulty but I am unconvinced as to whether we are going in the right direction. I have even dragged out of a dormant brain cell the knowledge that east is ‘est’ and west is ‘oest’. I was helped here by having supported the Timor L’est marathon runner during the Olympics (he was a long way behind everyone else). We cross the same bridge three times but no sign of whether we are heading est or oest, so Chris says we have to ask someone. This is usually his job but he speaks no French at all. We find someone with reasonable English who points vaguely. I just look pathetic and say (in English – I am such a wimp) ‘little road please’. Sure enough, here we are on the 132 est and it is well worth it, with awe inspiring views of the mighty St Lawrence at intervals. What must my north Devon emigrants have thought? A bit different from the Torridge! I love rivers, in fact I think I like them better than the sea. Is this because four generations of my ancestors lived on the banks of the Tamar? The houses are mostly clapperboard style, single story and with steep roofs, presumably because of the snowy season. Very few have what we would call gardens – just grass and the odd bush or tree. Like Australia, most settlements are linear with a deserted 1950s air. Now we are somewhere quieter we see our first pedestrians and plenty of election posters. Wherever we have been there have been masses of roadworks, accompanied by ‘stop-slow’ boards, as opposed to our ‘stop-go’. Fortunately some of the meagre French vocabulary that I have retained includes the difference between ‘arrete’ and ‘lentement’. I have huge respect for friends who are currently travelling round Europe on the wrong side of the road (for them) through places where, I am assuming, they cannot understand any of the written signs – unless their Albanian and Serbo-Croat is better than I think it is. Not being able to understand what is being said/written is like being deprived of ones senses and I find it very disconcerting. Even the 132 gets busier as we are south of Québec. This is not helped by the narrowing of the lanes due to yet more roadworks. Canadian traffic cones are larger than ours, in fact their tops are exactly level with our wing mirrors. I am not prepared to say how I can vouch for this fact but no traffic cones or wing mirrors were harmed in the course of writing this blog. We see several twin-spired, silvery churches, maize fields and harvesting being done. The farmers are probably making the most of the weather, which is still lovely. All the farms seem to have two tall cylindrical structures that we presume must be silos. We even find the very occasional pull-in from which to admire the Saint Lawrence. We had programmed the sat-nav to find us a Walmart, the address of which we had ascertained when we had internet access – cunning eh? What seems to be at the end of our route is something rather more upmarket and thus more expensive, than Walmart but time is getting on so we purchase our supplies and then look for the campsite, which is at another address the sat-nav does not recognise. Ha! Now I am justified in having used up a fair proportion of my baggage allowance with the Google maps. Talking of Ha! Westward Ho! often claims to be the only place name in the world with an exclamation mark. Not so! We have just driven through St Louis du Ha! Ha! and it is written thus on the map too. 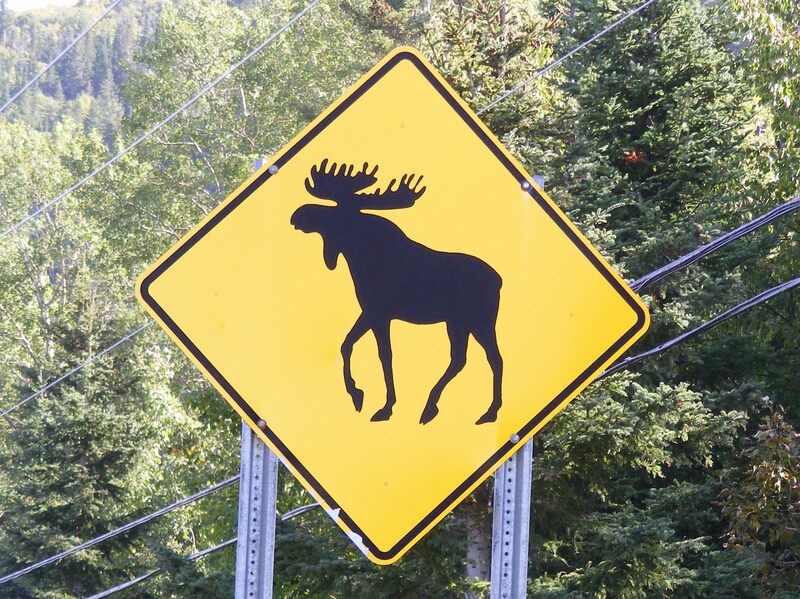 The sun is starting to set and flashing lights warn us of ‘elevated danger of moose’ but we see none. Probably just as well as at this point we are hurtling along road 85. 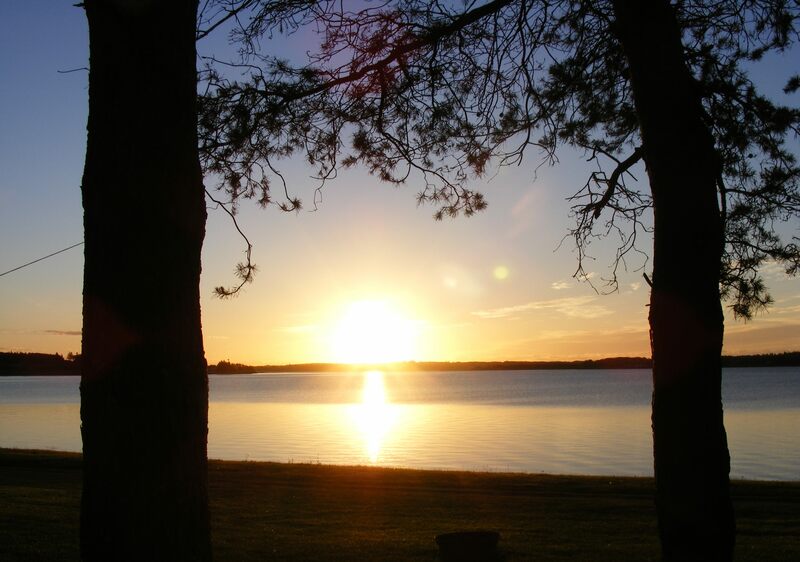 The site is found just as the sun sets and we draw up on a pitch beside the lake at Témiscouata-sur-lac – beautiful. The place is deserted and the vans that are on site look as if they are semi-permanent; used presumably by weekenders. We are too late to book in so I lack the wi-fi password. I do some guessing but fail – this isn’t as daft as it sounds – I managed to nearly guess an appropriate password (well, I was one character out) when in Scotland; site owners are not known for their cunning passwords. One we have stayed in already takes the prize as their password was the name of a Canadian animal but spelling was not the tech guy’s strong suit, so he spelt it incorrectly – no one will ever guess that! This rates as our favourite pitch so far. The night is windy and rainy and there are loud thumping noises as if something is trying to break in through the roof. Are these the bears of which we have been warned or just very heavy chipmunks? It turns out that this is merely innocuous and very light pine cones falling on the roof from the tree under which we are parked. We attempt to set the Sat-nav for our destination. Hiring the sat-nav was a very wise move. Despite my using half a tree to print off Google maps before we came, without it we would still be somewhere in Toronto. I attempt to set the sat-nav for today’s destination. The sat-nav doesn’t recognise it. Aware that we are entering French speaking Canada and the destination is Trois Rivieres, I wonder if perhaps the sat-nav is not biligual. Even my limited French can cope with Trois Rivieres but the sat-nav doesn’t recognise Three Rivers either. I try several other things including Québec with no success. Surely we don’t have an Ontario only sat-nav. After much fiddling we discover that each province has to be set separately and we are off. The disadvantage of the sat-nav is that it takes you along the direct route and we are yet to find the ‘avoid highways’ or ‘seek alternative route’ function. My lovely maps had opted for slightly less main roads but we fail to find these. This means that we spend the day on the not especially inspiring and monotonous road 417. This despite being Sunday, gets very busy as we get to Montreal. This journey is turning into the equivalent of one long high-adrenaline theme park ride. Did I say I don’t like theme parks? My stress levels are not reduced by two cars directly in front of us crashing into each other. Miraculously, despite bits flying off in all directions they career blithely onwards and Chris slows down in time, as does the vehicle behind us, so we emerge physically unscathed, if slightly un-nerved. 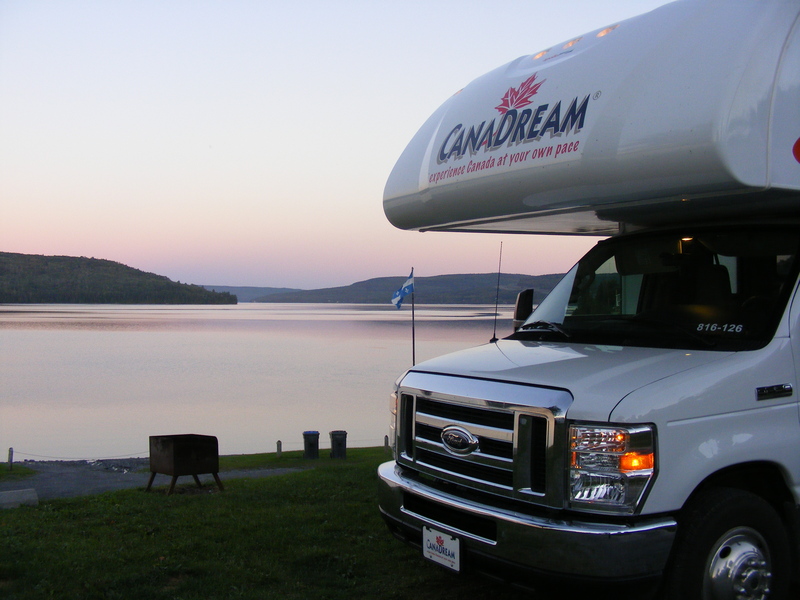 We are now in to our second Canadian province – Québec. Although we pronounce it Qwebec, it seems we should be saying Keybec instead. I had expected road signs to be in both French and English, a little like Wales but no; French alone. I just about know my droit from my gauche so can cope with most of these, including the ones that tell us we are going to die if we don’t rest. That is as maybe but stopping on Canadian roads does not seem to be an option. Even the slightly less busy sections don’t have lay-bys. There is also a distinct lack of garages and shops. We do eventually find the former and refuel. We press on to Lac St-Michel Campsite, where we opt for the pitch of the receptionist’s choice. This is not the most inspiring and today’s unwelcome wildlife is a plague of flies but we are close enough to the site office to intermittently pick up the free wifi, which is normally only accessible from the public buildings, from the van. It does keep dropping out which is frustrating but its occasional presence may be the highlight of today. We wander to the bottom of the site to look at one of the three rivers (Riviere Saint-Maurice) and then call it a day. I use the sporadic internet access to try to work out how we can continue east on anything except the Trans-Canadian Highway, of which I have already had more than enough.